The police department in Overland Park, Kansas, has long used in-car surveillance cameras to create a record of activities such as traffic stops and pursuits. Originally, collecting this video evidence entailed retrieving tapes from a trunk mounted VCR, cataloging them and transferring them to a storage facility. Chain of custody, reliability of the system and surveillance tape shelf life were all challenges. Entering the digital age, the city recently replaced its analog cameras with digital dash cams. Each high definition camera recorded its video surveillance stream to an SD memory card. Not by coincidence, a memory card fills up in about the amount of time a gas tank on a Ford Crown Victoria empties. 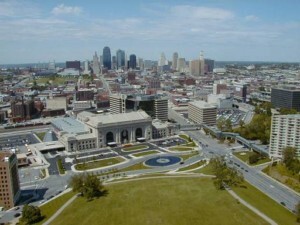 John Webb, Network Architect at City of Overland Park, Kansas, oversees a process whereby police cruisers automatically connect to the network while refueling and upload their data to a server. Gas pumps are necessarily located a safe distance from the building housing the servers. Enable‐IT 828 Gigabit Ethernet/PoE Extenders provide a high speed link to power Aruba wireless access points near the pumps. While the cruiser’s tank is filling, the system initiates a secure transfer of the camera data, complete with a full audit trail to help insure admissibility in court. The resulting process improves the department’s efficiency while reducing costs. We have been serving US national security needs, US federal agencies, and the commercial sector since 1997. We also offer waterproof solutions that are ideal for putting your PoE devices where you need them and not where you are limited to by IEEE Ethernet distance restrictions. Enable-IT is globally known for its superior engineered Ethernet Extender and PoE Extender solutions that deliver dramatic network performance-improvement and significant cost savings over traditional wireless or fiber technology. We are pioneers in the Ethernet and PoE industries. Our Ethernet Extenders and PoE Extenders deliver unsurpassed Ethernet performance, power, and reach! And we offer the most knowledgeable English-speaking customer service and technical support in the industry. Enable-IT is the only Ethernet Extender and PoE Extender source on the planet who can guarantee 100% US-based design, development, manufacture, shipping, and support of our superior Ethernet Extender and PoE Extender Solutions. Our gracious customer service teams and knowledgeable technical support teams are 100% based in the USA, too. They are highly trained and highly skilled in Ethernet and PoE troubleshooting—and they are easy to understand and happy to help! Enable-IT 828 PoE Extender Manual Used in Police Mobile Surveillance in the City of Overland Park!